Stepped contemporary plaster cornice uplighter with a trough for ambient strip lightingWilliam Wilson Architectural Mouldings Ltd are experts in contemporary plaster mouldings, with the ideas, skills and expertise to give your home or business a real wow factor. With clean straight lines or elegant sweeping curves, contemporary plasterwork is ideal for creating eye-catching styling for private homes and business premises, such as casinos, bars, restaurants, cinemas, hotels and offices. We can design from scratch, provide advice or work with your own ideas to produce something unique and fitting to your property. 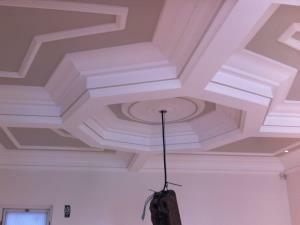 Looking for a decorative ceiling with modern contemporary styling? What about using mood lighting? Plaster cornices with hidden channels to hold strip lighting create a stunning visual effect and greatly enhance the character of an otherwise boring ceiling. Extensive art deco plaster cornice work and panel mouldings for a Preston propertyWe also offer Plaster Moulding Restoration services and can restore original features to art deco properties. Or if you just love the style, we can create an art deco look for newer buildings. 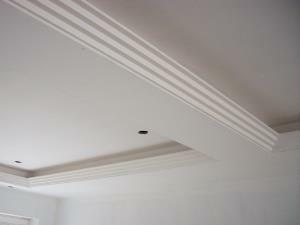 For examples of our Contemporary Plaster Mouldings work, please take a look at the Photo Gallery page. We can supply, fit and restore contemporary plaster mouldings to homes, businesses and historic buildings in: Accrington, Barrow, Blackburn, Blackpool, Bolton, Burnley, Bury, Carlisle, Chester, Chorley, Cumbria, Fleetwood, Garstang, Kendal, Lancaster, Leyland, Lytham St Annes, Morecambe, Oldham, Poulton-le-Fylde, Preston, Skelmersdale, Southport, Thornton-Cleveleys, Ulverston, Warrington, Widnes, Wigan, Wilmslow, Windermere, Wirral, and more!